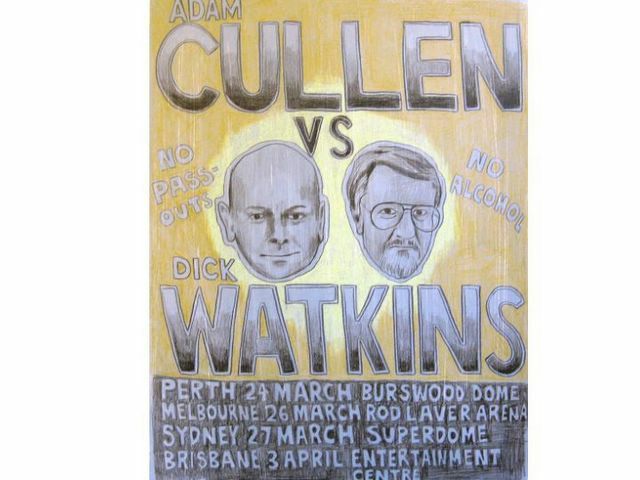 Geoffery Newton, Cullen V Watkins. Coloured pencil on paper, 2005. Courtesy of the artist and neon parc, melbourne. 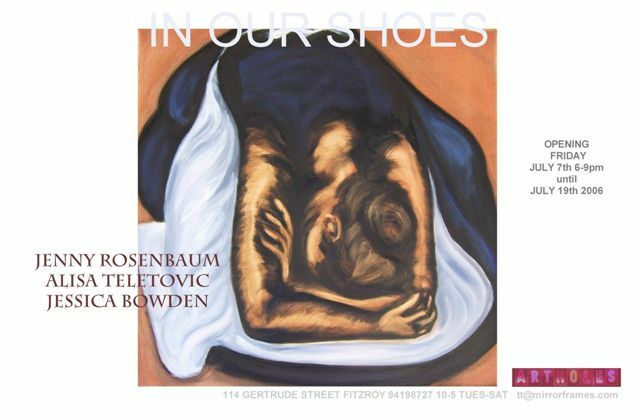 WHERE: SYDNEY COLLEGE OF THE ARTS GALLERIES, The University of Sydney, Balmain Road, Rozelle (enter at Cecily St), Tues-Fri 11-5, Sat 11-4. 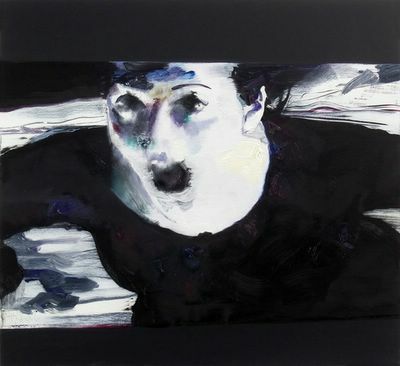 Nigel Milsom, Untitled (Chorus), Oil on Canvas, 2006. Artist’s Statement: I sat down on the bench at the bus stop opposite the park near where I live. It was 7:15am and I was on my way to work. Beside me on the bench was a postcard, I picked it up and stared at the image on the front. It appeared illusive but powerful, the harder I stared trying to make out the image, the more it faded until it disappeared completely leaving the postcard blank. At the same time, I heard music coming from the Community Hall across the roadway, mournful voices singing to the haunted sounds of the piano accordion. The singing became louder and more intense. A short time later, buses nowhere. A distressed woman came to me, 7:17am, holding to her breast a postcard similar to the one I picked up minutes earlier. Looking at me with tears in her eyes she cried, Here is a postcard from Spain to you from me. The bull on this postcard looks angry as though he’s going to attack someone. That bull looks crazed and possessed. Maybe someone has provoked that bull? I turned away confused. The distressed woman began screaming, punching her fists in the air, whilst the CHOIR from across the roadway continued to sing dramatic, painful hymns. It was now 7:20am, still no bus; I jumped up angrily and began the long walk to work with soreness in my eyes. Zuza’s paintings explore memory, atmospheric light, composition and the saturated colours of seasonal landscape. This particular series was influenced by the miniature worlds captured by polaroids. 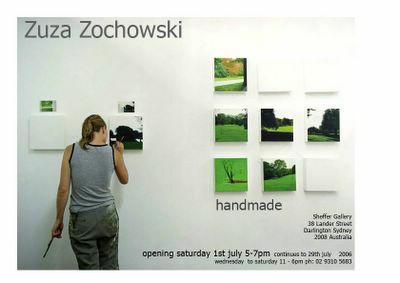 Zuza uses photography as a reference and then applies her own interpretation to the captured moment on canvas. Suggestive and enigmatic in their quality, the viewer is drawn in closer to the small scale works which reveals Zuza’s experiments with embroidery and drawing onto the canvas. The resulting works are intimate portraits of a specific place at a given point in time, often suggestive and enigmatic within their simplicity. 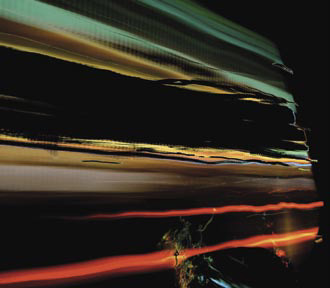 Daniel Crooks, Static No.9 (a small section of something larger), 2005. 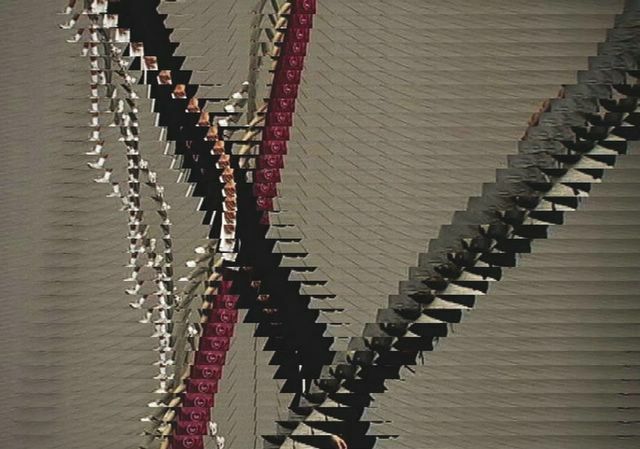 Still (detail) from DV/DVD, 13:23 minutes. Courtesy the artist and Sherman Galleries, Sydney. Everything in the universe is constantly shifting and changing. Art Movement is about how we perceive this perpetual motion, and how it can be represented. New and recent works conceptualise actual and impossible physical movement. Video, lenticular photography, sculpture, interactivity and architecture are employed to explore contemporary states of constant flux. Art Movement will be accompanied by an exhibition booklet with a text by Gabrielle Finnane. This one-night-only project, curated by Danielle Freakley, incorporates a breadth of Melbourne artists including: Kate Daw, Kate Fulton, Jon Campbell, Katie Jacobs, Grant McCracken, Sue Osborne, Rowena Martinich, Paul Compton, Matt Sully, Noam Shoan and Ash Keating among others. Danielle Freakley’s one-night-only performance at Spacement Gallery incorporates several of Melbourne’s local emerging and established artists. In the shadow of Barthes’ ‘Death of the Author’, the project sets up a very real and dynamic tension between: Artist, Artwork, and Audience. Each of the 13 participating artists will show their most familiar (or ‘representative’) art piece. They will stand before their artwork – almost as though on display themselves, as ambassadors for their practice. The twist in this exhibition is the silence that will pervade the gallery. There will be no verbal communication between artists or audience. As a way of turning the usual, familiar gallery-opening ritual inside out, this exhibition creates a dynamic where the audience must attempt to judge the artwork in unison with the appearance of the artist. As its ambassador, the artist and the artwork are inseparable. The opposite also holds true: the audience will feel the artist’s judgment on them. As is typical of Freakleys exciting and prolific art practice, her works often upset the usual order of the exhibiting process. Embracing sharp wit and humor, she very cleverly turns the art-world in on its head by unraveling the underlying systems upon which it is founded, and revealing the personal tensions which play such a significant (and often painful) role in an artists career. Her on-going exhibition project ‘Artist Running Space’, for example, involves herself as the primary subject of the work as a living, breathing gallery space dressed in white from head to toe, upon which artists ‘install’ their work (see documentation and ‘floor plan’ on www.artistrunningspace.com). She is not afraid to disrupt the order of experiencing art, and setting up new gallery models by which to present (or inhabit) the work. As such, she has recently been gaining wide acclaim for her adventurous projects. 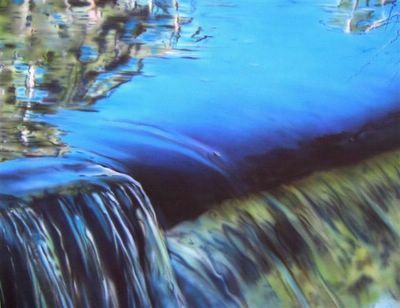 Having recently gained her Masters Degree in Fine Arts at VCA in Melbourne, she has been exhibiting widely throughout Melbourne and Australia. Recent highlights include ‘Artist Running Space’ Mori Gallery, Sydney (June 2006), ‘Sedition’ Casula Powerhouse, NSW, ‘There’s nothing to be ashamed of in choosing Happiness’ AVA Gallery, London, 2004 ‘Check Point’ Mori gallery, Sydney, ‘Work in Progress’ Spacement, Melbourne. Opens at PELT on the Wednesday 28 June 2006. 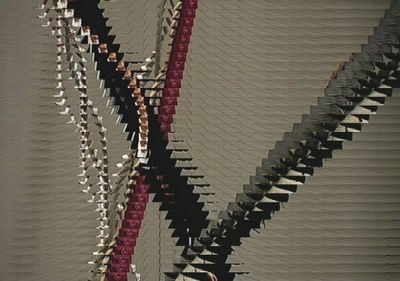 Real-tearing Stream is a collection of sound, and video created solely within a digital systems. Each element has been duplicated, cut, layered, stretched, separated and reconstructed to appear ‘real’, or perhaps as a recording of something real. What is heard is then only files of data, created from themselves, which have been stored in various digital mediums after creation. Ivar Lehtsalu is a Sydney based electronic artist that primarily uses software and digital systems to create sound and video works. Ivar is currently finishing his Bachelor of Electronic Arts (Honours) degree at the University of Western Sydney. Ivar is also an electronic musical improviser who has played impermanent.audio, Nownow festival, Electrofringe Festival and regularly at other events in Sydney, Penrith and Wollongong. Ivar has contributed to various group shows as a part of Sydney collective Dysfunctional Feed. This is Ivars first solo exhibition.